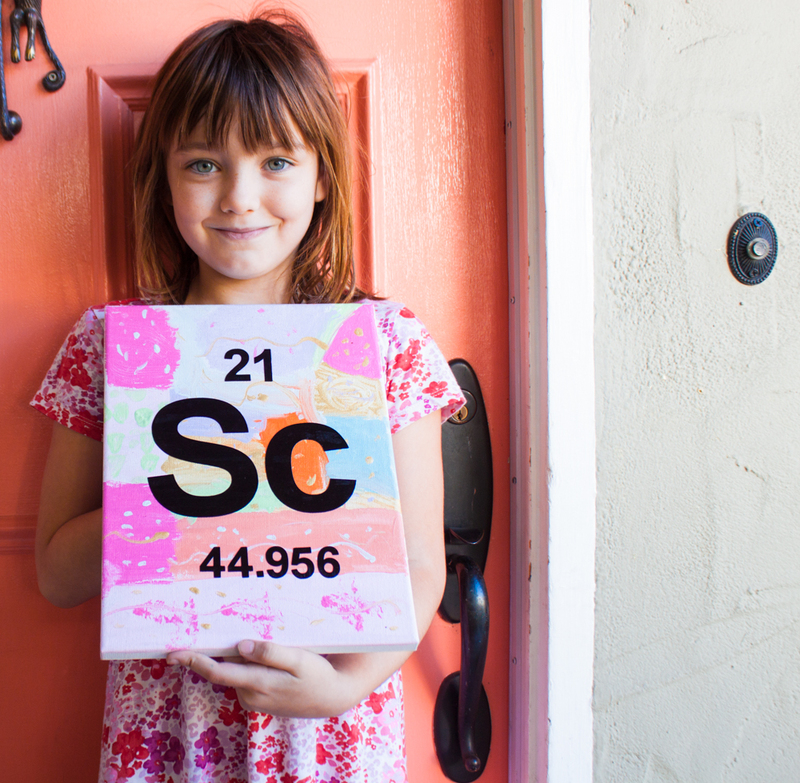 This post in inspired by scientists, little girls, and Goldieblox: three of our favorite things. 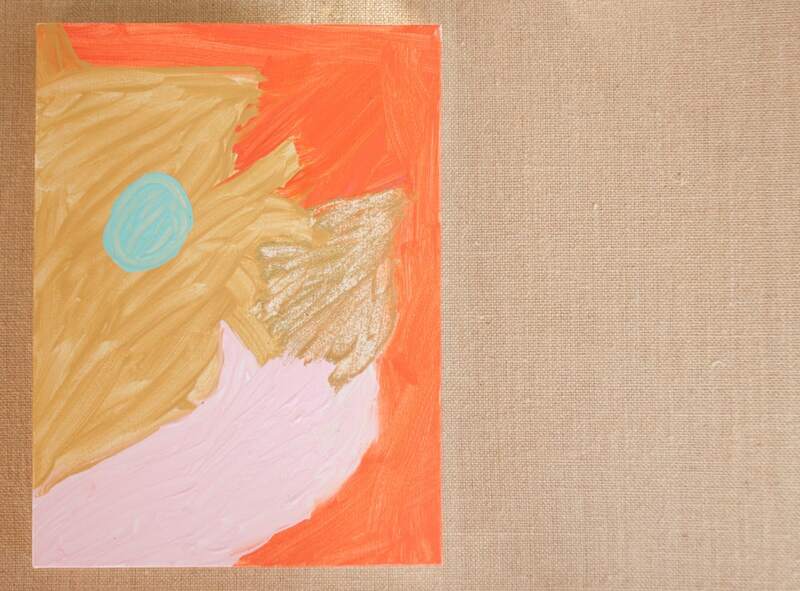 If you ask my daughter what she wants to be when she grows up, she replies confidently “Oh, I am going to be a scientist-artist.” Just like that. Done. To me, this sounds like an awesome job. Or at least a good start at thinking about a future awesome job, so I am doing my best to encourage her science and art leanings. I love me some science, but I can’t say chemistry or physics education are really where I shine as far as parenting. We watch her favorite TV Show, Cosmos (find it on Netflix now, it’s awesome), together on the regular, and we do art projects. Could I think of some type of activity for us that would encompass both of her chosen careers? What I came up with is an exercise in abstract art combined with a lesson on the nature of the universe via the Periodic table. When we were done, she seemed pretty proud. The weekend we spent working on this project was so fun and enlightening for both of us, and this project is easy-peasy for any family to do together. 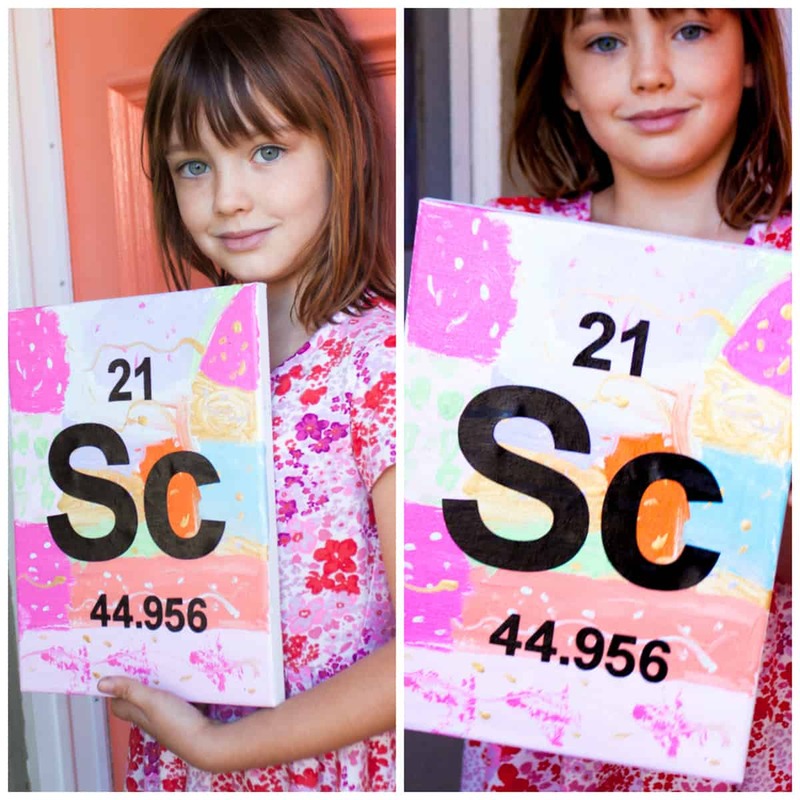 If you have a little scientist-artist on your hands, I wholeheartedly endorse this painting/stencil art project. 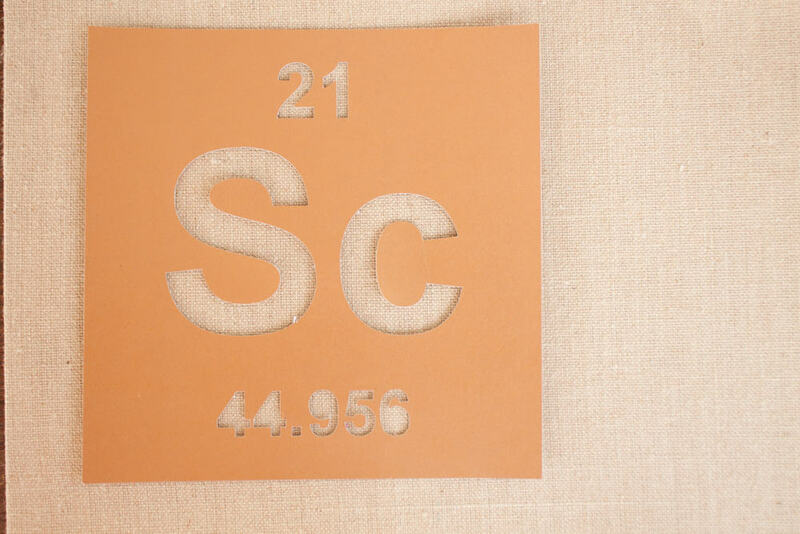 I scoured the periodic table for an element that would connect with Scarlet… and scandium it was. 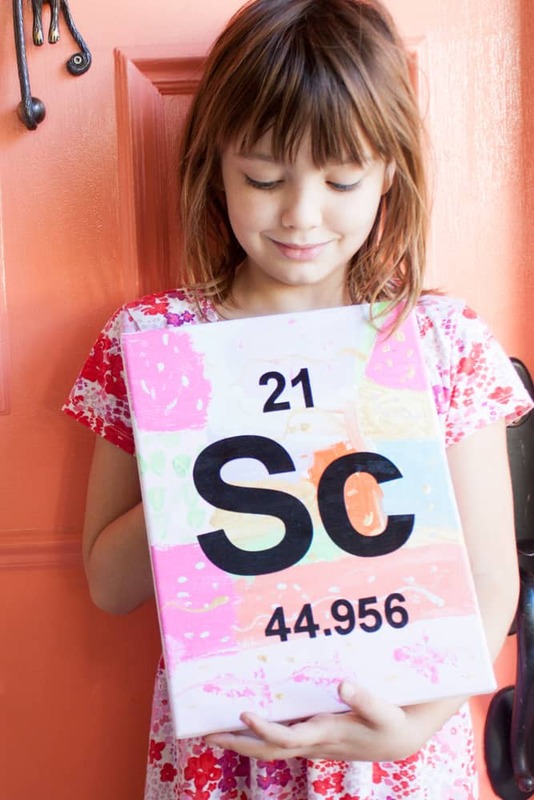 Search for an element that your child will connect with, either by the initials or the properties, it really doesn’t matter at this age. This endeavor is just a window into talking about how the universe works. 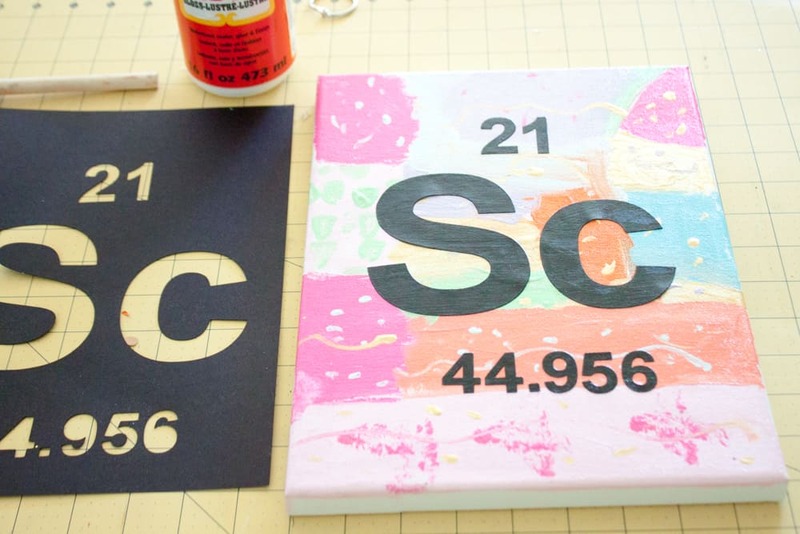 So pick one, then get to painting, stenciling, and talking about science with your little one. Put a selection of brushes, some paper towels, and a cup of water in front of her. 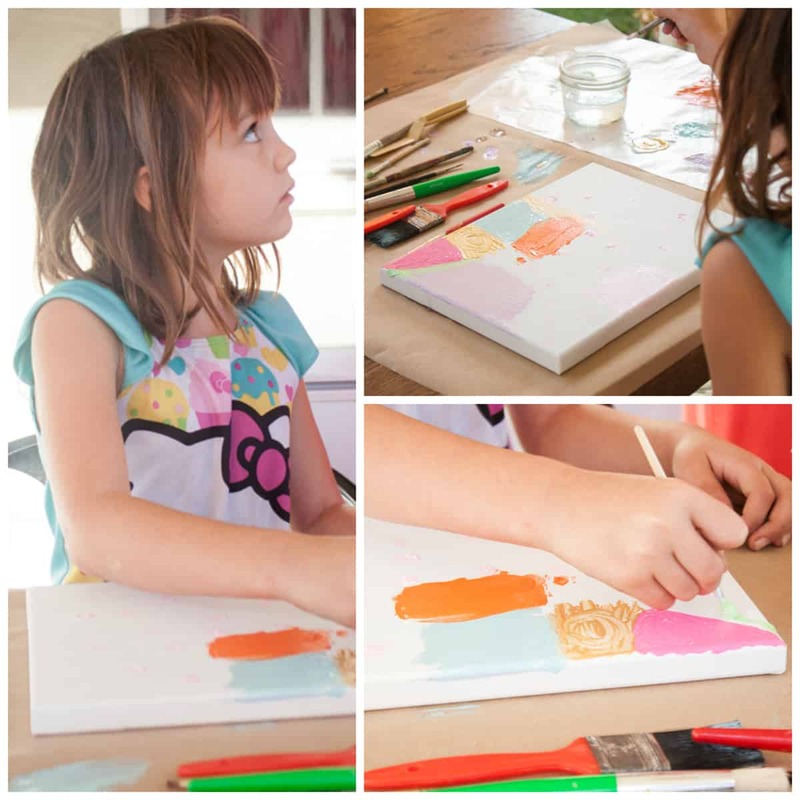 Give her a canvas (we used an 11″ X 16″ stretched artist canvas) on which to make her abstract vision come to life. She is going to be excited. 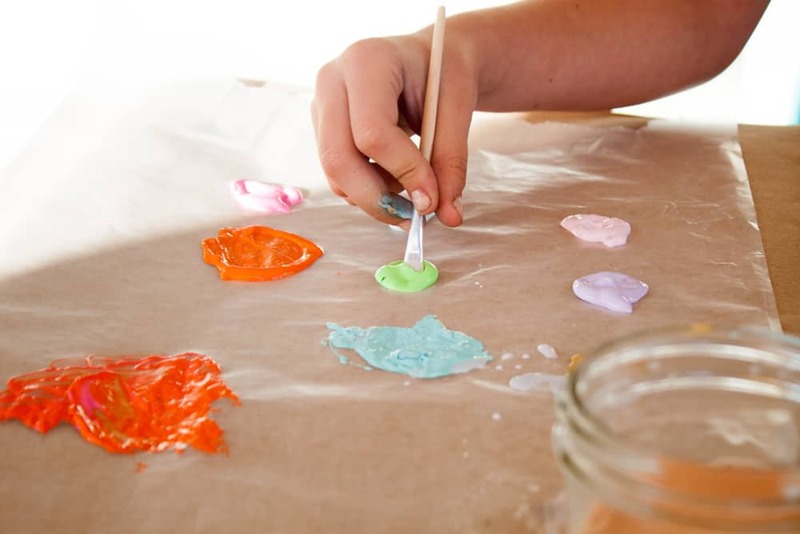 Teach her how to mix colors… how to use a different brush or clean in between double-dipping to keep her colors from getting muddied. Now it’s time to let her paint. Resist the urge to tell her what color should go where. Just watch the magic happen. Once her creation is done, let it dry. I also made one. It wasn’t nearly as pretty as hers. Which I know because she told me that fairly succinctly. 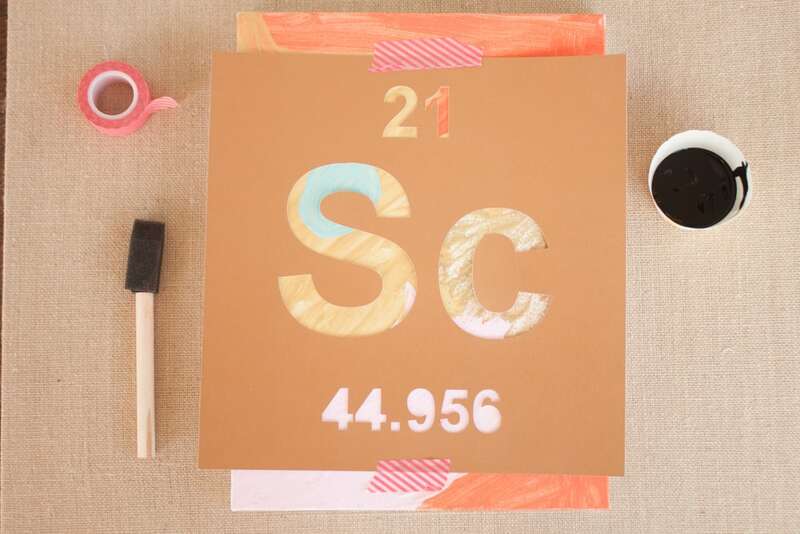 Now it’s time to make your periodic table information. You can make a stencil like this if you have a silhouette or other stencil-making capabilities. 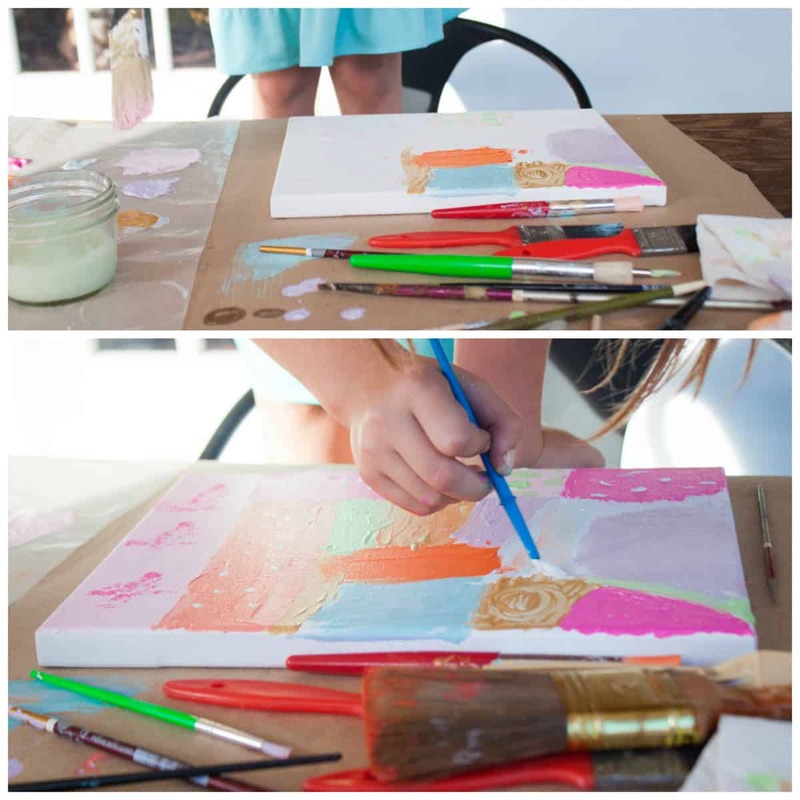 Then you can get your foam brush ready and attach your stencil to your dry painting with washi tape. Now paint that stencil in! So to make it looks like our final product, use our alternate method. 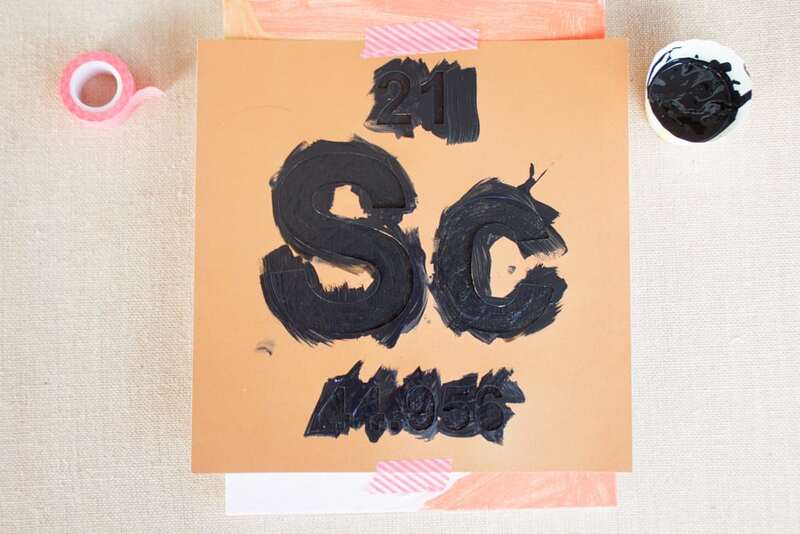 For this tight look, just wait until your canvas is completely dry (overnight), then lightly apply a layer of mod podge (we used gloss), then lay the black cut-outs of letters and numbers down, then another layer of mod podge on top. 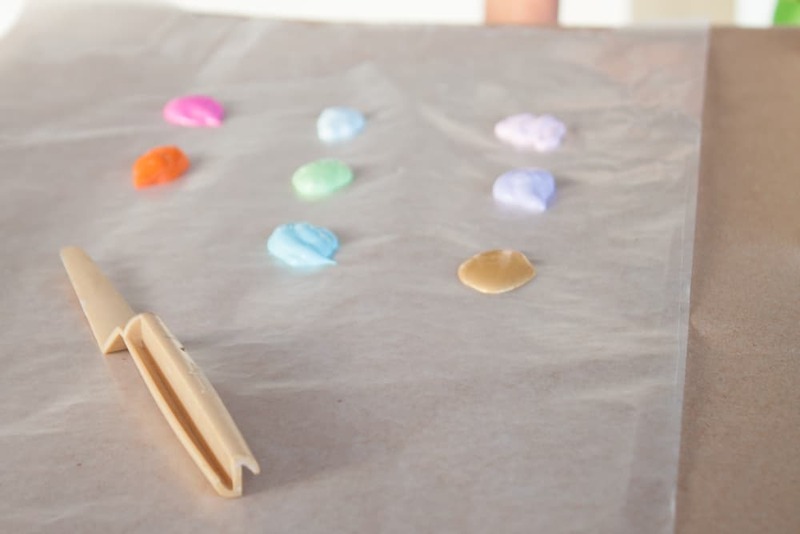 Let it dry completely, then add another layer to seal. Let it dry. Done! Pride. This idea was inspired by the engineering toys from Goldieblox. 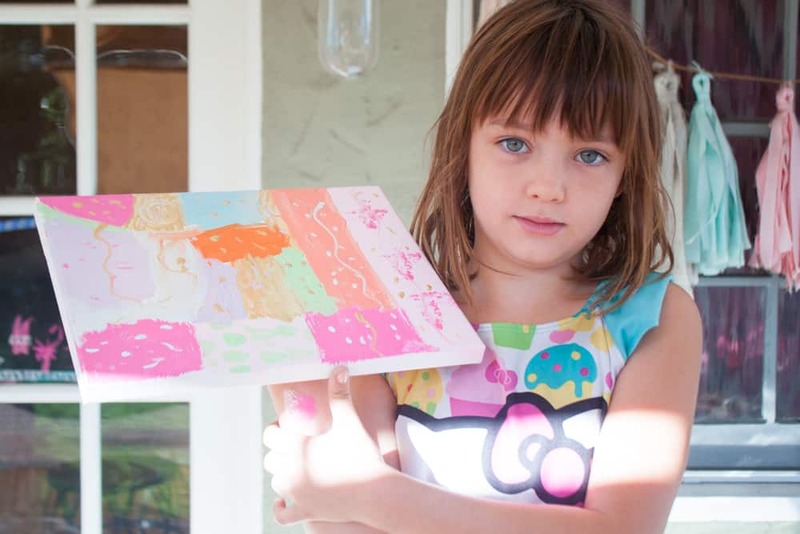 They sent us some Goldieblox kits and asked us if and how they might inspire our daughters. I am speaking in my own voice with my own opinions when I say the new Goldieblox toys are awesome. Scarlet the scientist-artist is obsessed with them! 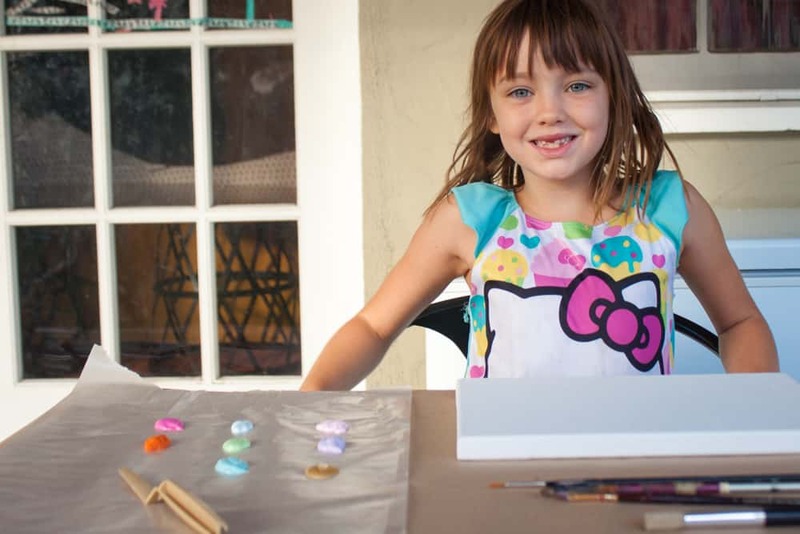 Her favorite is Goldieblox and the Movie Machine, in which she read the story, then built an old-fashioned (but working!) zeotrope. Don’t know what a zeotrope is? Neither did I! So we all learn something new. She worked hard on building her movie machine, and even the grandparents got in on the action when it was all done. What I love about this toy is that it is a building toy with a design you can follow, but it’s not just a one-time play kinda thing (as in, you don’t just build it once then watch your kid get bored of playing with it). Once she built the machine, the book gave Scarlet all sorts of options for new movies she could make herself to play in the machine. So she’s been drawing frames for one-second movies (based on waves, the sun, etc.) to place inside the “drum” and attach to the “axle”… yes, this toy is teaching her the proper building words for things. I love it. 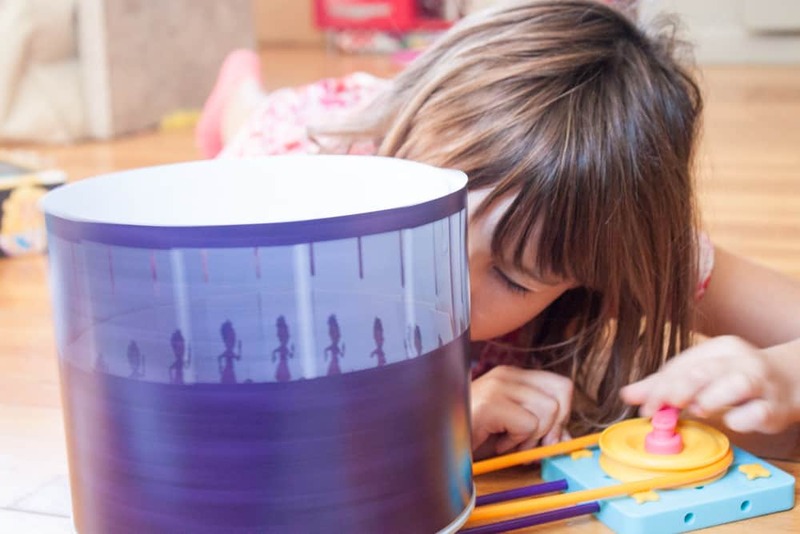 Enter to win a set of Goldieblox engineering toys for your little scientists here. I think mine would just love anything to tinker with… gizmos and gadgets that fit into each other and make things, but take a little thinking to make it happen! 🙂 Thanks for the giveaway! My little one is getting into designing houses and buildings. I’d like to see more girl-styled toys focused on architecture, something a little more complex and realistic than Legos. I really love this—so so neat! So fun, inspiring, and educational! I think both my kids would love building something like a marble run. 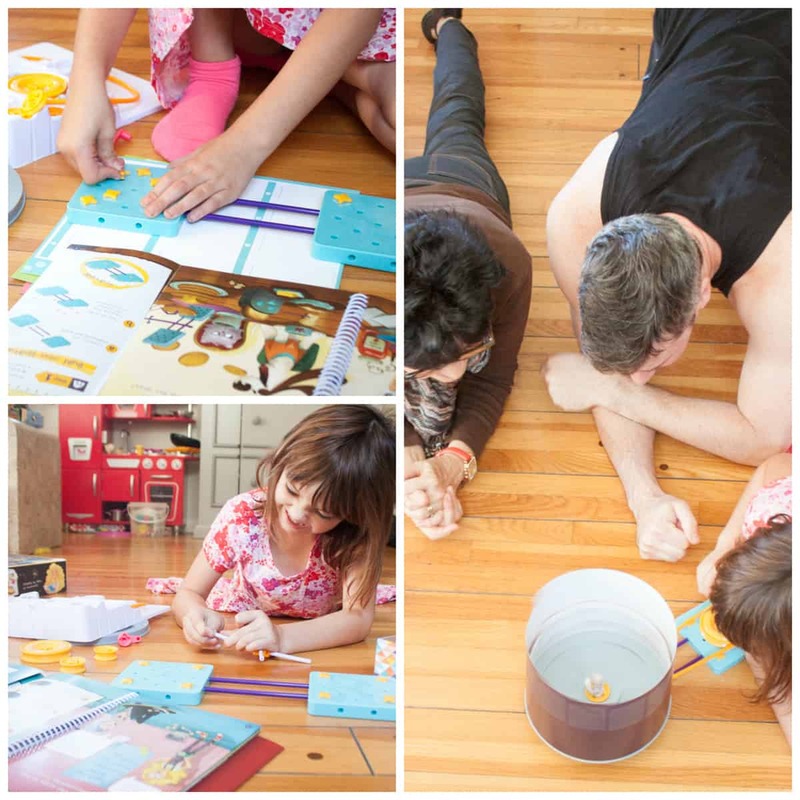 Loving the premise of Goldieblox- it’s about time! My youngest loves cars, so anything involving cars she would love. My kids cannot wait to make these! The next day off of school this project is on our list! Engineering projects are great, but I would like a nice range of chemistry projects for my girl. I love this! My daughter has settled on “astronaut-princess” which sounds pretty great to me. We love our GoldieBlox too! L got a set for her 4th birthday and it has been a favorite around our house. I love astronaut princess! She could become the leader of a new planet! I would love the movie machine to work on with the little girls in my Pre-k and summer camp classes! My daughter is still on the young side, but I think that introducing science and engineering ideas through play is important from a young age. I loved playing with science kits and I think it helped foster my appreciate for science and it made the pursuit of science a natural option for me. I think that my daughter would especially love the movie machine. There was a large one at the local science museum when I was a child and I found it fascinating. 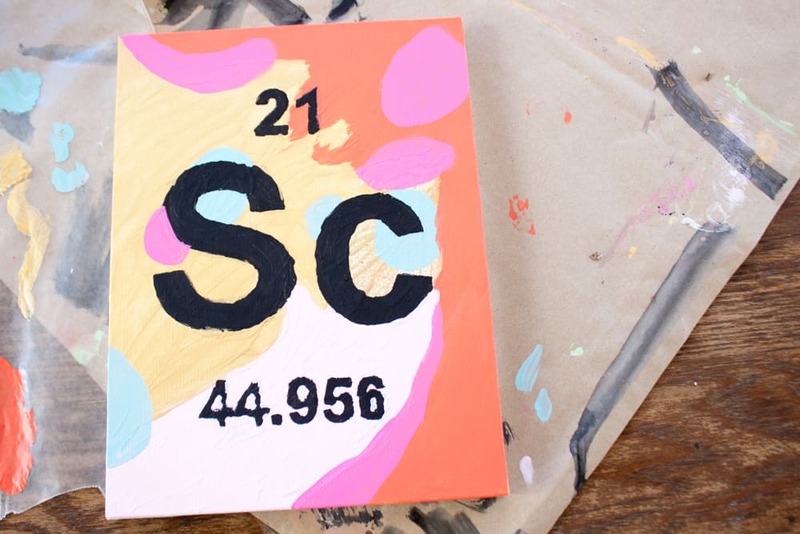 I have three little scientists who would love this craft. Thank you so much for sharing and thank you for the giveaway! My daughter is so not girlie so I’d love to introduce a little more engineering an since into her play. My girls are always building things and taking things apart. They would love to see a horse or lion engineering project. They would love anything that melds engineering with animals. Thank you for the wonderful giveaway. My daughter just drew up her plans for her dream house yesterday, and she loves to build with Lincoln Logs, so I think she would love an architecture kit. My daughter would love to create her own fairy houses out of natural building materials!